Joe Mack McAlester has worked in real estate the past seven years, receiving his broker license three years ago. In addition, McAlester completed auction training in January of 2016, which allows United Country Real Estate - J-Mack Realty and Auction to offer traditional listing strategies as well as personal property and estate auctions. With a background in ranching, McAlester knows Wilburton and is very familiar with the land and people of Latimer County. Joe made the decision to open his own office in 2015 and is excited to better serve his customers in an honest and professional manner. Partnering with United Country allows J-Mack Realty and Auction to utilize industry-leading tools to better market your properties. Our team is excited to serve our community and looks forward to accommodating the strategy that best serves our clients. J-Mack Realty and Auction is a family-owned business where honesty and integrity are of the utmost importance. 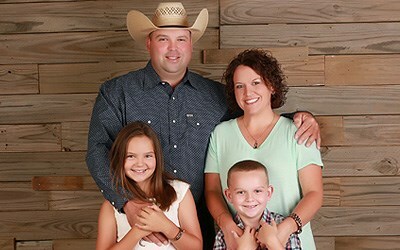 Joe and his wife Heidi live in Wilburton with their two children Laney Jo and Cash.